Justice Marie Deschamps received a Licentiate in Laws from the Université de Montréal in 1974 and an LL.M. from McGill University in 1983. The Université de Montréal awarded her an honorary doctorate in 2008. She was called to the Quebec Bar in 1975 and practised as a trial lawyer at Martineau Walker and Sylvestre et Matte in commercial, family and civil law, then at Rouleau, Rumanek and Sirois in criminal law, and finally at Byers Casgrain in commercial and civil law. 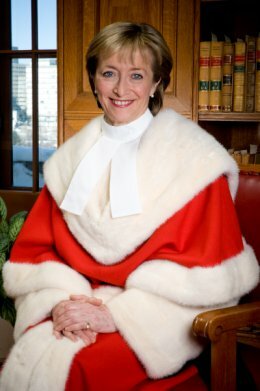 She was appointed to the Quebec Superior Court on March 29, 1990, to the Quebec Court of Appeal on May 6, 1992 and to the Supreme Court of Canada on August 7, 2002. Justice Deschamps has participated in the Université de Montréal's advocacy classes for many years and in the Barreau du Québec's advocacy seminars for more than 25 years. She has also been an adjunct professor in the law faculty of the Université de Sherbrooke since 2006 and in that of McGill University since 2012. She has been a member of the board of the Université de Montréal and a member of the board of directors of the Université de Montréal's alumni association. She also sat on the advisory committee on reform of the Bankruptcy Act in 1986 and on the Competition Tribunal advisory council from 1986 to 1990. She was inducted as a member of the American College of Trial Lawyers in 2005. While at the Supreme Court of Canada, Justice Deschamps took a particular interest in the Court's Law Clerk Program, and she also sat on a number of committees of the Canadian Judicial Council and the National Judicial Institute. Justice Deschamps was born in Repentigny, Quebec, on October 2, 1952. Her spouse, Paul Gobeil, is a businessman. They have two children: Valérie and Maxime. Justice Deschamps is a sports enthusiast who skis, swims, hikes and jogs. Her interests also include art, travel and languages (in addition to French, her mother tongue, she speaks fluent English and has studied Italian and Spanish). She retired from the judiciary on August 7, 2012.